Notice to sewer users about sump pump drainage! 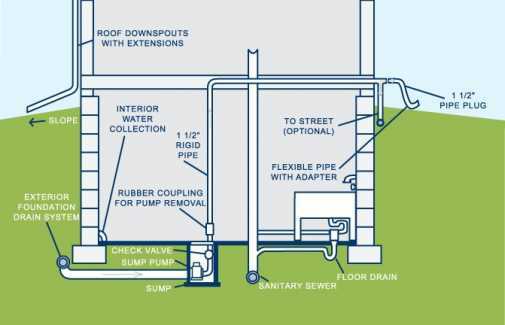 Sump pumps may not legally connect to a sanitary sewer, but some in Gay do. Sump pumps contribute to flooding of the drain field, resulting in expensive repairs. Homeowners can ‘daylight’ sump water to the outdoors. Using perforated drainpipe at the terminal end and straw insulation can resolve potential freezing and spread discharge over a large area. The Keweenaw County Road Commission and the county engineer agreed to modify ditches in 2015 so they flow away from the community, allowing homeowners to discharge sump-water to the ditches. We will not inspect your basement for correct plumbing. Rather, all users will share the cost of repairs to the sewer system, including those for sump-water overload. So, be a good neighbor and daylight your sump-water. For more information on our sewer system and diagrams on daylighting sump water, please see the Township Tattler for fall 2013, spring 2014, and fall 2014.